Aleph develops and produces technologically advanced products for all printing processes and focuses on international market trends. Aleph’s Board Member, Alessandro Floridia says “you can’t stop the migration to digital. The innovation improvement process is moving in this direction and it can’t be stopped”. 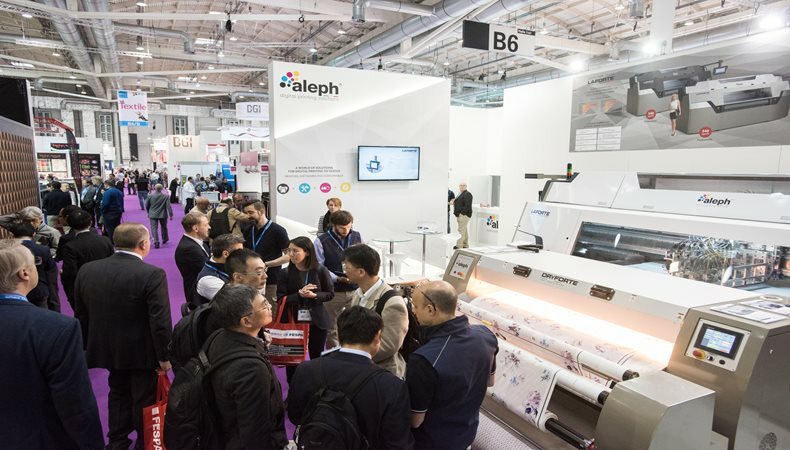 Due to Aleph’s ability to continuously evolve depending on market dynamics they have become one of the most significant printer manufacturers in the world. The LaForte Studio Paper 340 will be presented at FESPA 2018. This machine has been specifically designed to meet the need for an effective solution for sublimation paper on wide formats. Since the price of transfer paper has decreased and its popularity has increased, customers now find that transfer printing is more effective than direct printing. The LaForte Studio Paper 340 guarantees the highest quality featuring lighter and cheaper paper. It reaches a speed of up to 600 sqm/h and features a patented rotary belt with an air vacuum system. There are several reasons that support the effectiveness of transfer printing. Transfer printing uses 20% to 30% less ink at no additional costs, printing is consistently on the same media, it is possible to print on a wide range of textiles and colours are more vivid and there is no risk of ink rubbing off.